Introductory thoughts concerning the Assembly’s work and history on main points of contention through its deliberations. In attempting a study or overview of the history of the Westminster Assembly, resources that place its history in perspective are relatively few in number. John Baillie informs us that many in the Assembly took copious notes, but only John Lightfoot’s journal, Baillie’s letters and Gillespie’s notes have been made available (one may also turn to Daniel Neal’s History of the Puritans). Thomas Goodwin, that leading Independent divine, is said to have written fifteen volumes of notes, but only three rare volumes of that fifteen survive today. Before the immediate historical period of the Assembly is observed, it is important for one to have a clear knowledge of the historical events in both England and Scotland leading up to the meetings of the Assembly. King Henry had taken upon himself the title of “Supreme head of the Church” in contrast to the Pope who would not grant him a divorce from his wife. This fatal move of the king’s supposed right over the church may be directly traced to all the corruptions of that Church of England, and all subsequent civil calamities that were a result of that move. England did not receive an ecclesiastical pope at this time, rather, it gained a royal one. In 1538 the English translation of the Bible was published and injunctions were given to the church to have a copy of the bible in their churches for all to read. This requisition subsequently occurred after the death of Tyndale by order of the king. Tyndale had prayed that the king’s eyes would be opened (his last prayer) and by God’s grace such occurrence did happen. This allowed the English Bible to sweep across the land in the vulgar tongue of the people. After Henry had died, Cranmer at this time, under the reign of Edward VI began persecuting the Protestants and the reformation of the Church. In 1548 communion was allowed to be received in both the roman Catholic Mass as well as in the Protestant simplicity of the table. In 1551 the Book of Ordinances was ratified and created a rigidity in the Church of England in liturgical form. John Hooper condemned much in the book, such as the use of vestments, when he was forced to be consecrated as a bishop. Bucer desired compliance for a time, in order to discuss the use of these vestments. But from this time forward there arose a party in England that desired to overthrow all superstitions in the Church and parley for a full reformation of worship. In 1552 the reformers of the day made certain alterations in the Book of Common Prayer and this was ratified by an act of Parliament. The Articles of Religion were written, chiefly by Cranmer and Ridley now converted, and published by the king’s authority. The king then died, and Queen Mary came to the throne to reinstitute Roman Catholicism in 1553. All of the acts of king Edward toward reformation were overthrown by one swoop of Mary’s intolerance to anything but the Roman Church. In 1558 Mary died and Elizabeth took the throne hoping to bring unity to the kingdom under the guise of one mother Church of England with one common prayer book. This Act of Uniformity was passed and from that time the Puritans were persecuted for their non-conformity. As a result the Puritans were persecuted harshly, and many of them were ejected from their pulpits. They found it very difficult to obtain opportunities for preaching during this “pseudo reformation” of the Mother Church. They decided that they must meet in separate congregations away from the church, though not to dissolve the relationship and government of the church, and when Elizabeth found this out she commanded her commissioners to take effectual measures to keep the laity in parish churches rather than in Puritan churches. When the Common Prayer Book was actually finished, and the Puritans were pressed to conform to it, they refused, and their preaching licenses were stripped from them. The Puritans address the Parliament with their grievances in a paper entitled An Admonition to the Parliament, which turned into a quarrel of sorts between Whitgift and Cartwright. Yet, because of the Queen’s arbitrary procedures, the Puritans were not appeased in any way. There was little possibility of reconciliation between the Mother Church and the Puritan party. Puritanism, from that time forth became a systematized organization enabling it to live on no matter what tyranny prevailed. The sufferings of the Puritans continued unabated, many of them being silenced, imprisoned, banished, and otherwise oppressed by the prelate. The Brownists, at this time, rose up under the bitter preaching of Robert Brown who went from place to place throughout England preaching against the Prelacy, but encouraged the people to form a new party against the Puritans and the Prelacy – Independent Congregations without affiliation. After many imprisonments he decided to leave England for Holland, and there began a church after “his own fancy”, but soon it was torn to pieces from internal dissension, and Brown return to England to preach again. This was the first Congregational or Independent church, though that does not mean that all Independent or Congregational churches today are directly associated with Brown’s bitter and unorthodox tactics. Puritanism matured just before the death of Queen Elizabeth, and many Puritan ministers published many tracts, pamphlets and books on true religion in opposition, and a desire to reform, the Church of England. At this point they became known as Doctrinal Puritans. Elizabeth died and King James I took the throne. The Puritans were really in no better hands with James than they were with Elizabeth. Some clergy became embittered and took on some of the first principles taught by Brown and started Independent congregations apart from the Church. Henry Jacob was one of these who fled to Holland, met Mr. Robinson, a pastor of a congregational church, and adopted his principles for England returning there in 1616. This would be the beginning of the Baptistic movement later in England’s history. King James died in 1625 and Charles I took the throne, though the kingdom was in a deplorable condition. Charles made this even more deplorable when he dissolved parliament, threw the leaders into prison, desired to raise money for a foreign army, and resolved to fight against the Scots who were waiting along England’s borders because of political and ecclesiastical pressures. After Charles raised enough money and began to march on Scotland, he found it necessary to call Parliament together again in order for negotiations to take place between England and Scotland. This Parliament had been deemed Long Parliament because of its long tenure. Parliament was to rectify the long standing problems of Popery and Religion in England, Scotland and Ireland. The Catholic canons of the late convocation under James was deemed illegal, and a new standard was to be set in place over the island. In 1643 it was decided that an assembly of divines should meet in order to complete the necessary reformation between England, Ireland and Scotland for matters of civil and religious good. England wished for a civil league with Scotland to rectify the grievances brought between the two countries, but Scotland wanted a religious covenant bringing them together instead. This would ultimately set in place the Solemn League that forever bound the island together (and Presbyterianism) in mutual attestation to a pure religious conformity. The Assembly of divines met together on July 1, 1643. Dr. Twisse was appointed prolocutor and was succeeded by Mr. Herle upon his death. Dr. Burgess and Mr. White were assessors to the prolocutor, and to take the chair on Twisse’s occasional absence. It was neither a Convocation, nor a Presbyterian Synod or General Assembly. Rather its purpose was twofold: 1) that though there was a Christian church in England, it was not organized, and 2) they should set forth the points of government and discipline which require the civil authority for their full efficiency. Within the Assembly were three main outspoken parties, the Erastians (such as Coleman, Selden and Lightfoot, taken from Erastus, a physician at Heidelberg who wrote on the subject of church government in 1568), the Presbyterians (which constructed most of the Assembly; such as Rutherford, Twisse, Gillespie, Reynolds and Gouge), and the Independents. The most remarkable of the Independents were Goodwin, Bridge, Burroughs, Nye and Simpson, also deemed The Five Dissenting Brethren due to their stance on congregationalism. The Puritans in general, although they had received Episcopal ordination, and had been exercising their ministry in the Church of England, were nearly all Presbyterians. The Scottish commissioners were not formally identified as a separate part since they were in all points agreed with the English Presbyterians (these are Alexander Henderson, Samuel Rutherford, George Gillespie and Robert Baillie (in which the church is indebted for his writings on the Assembly)). At the same time the Assembly was meeting at these beginning stages, many sects were growing around England. Prelatic writers attribute this to schism against the founded Prelacy itself with no regard for doctrine. Rather, it would be better to ask how the Prelacy governed the people of the realm in distinction to how they taught them. Tyrannical tendencies do no educate people. Both Queen Elizabeth and King James did not desire an educated realm, but rather, an ignorant slavish people to concede to their whims and fancy about ecclesiastical doctrine. It is not a wonder, then, that various Sectarians grew up out of the established “Church” in order to escape the bitter hardship of superstition and a form of religion to better suit their own desires, but by those who were poorly educated in the things of God. Rather, a lesson should be taken from the Scottish Church. When king Charles II came to the throne during the restoration, the Scottish church was thrown into a sever time of persecution for twenty-eight years. This, though, did not cause the church to split, for those educated in the things of God forged by conviction cannot let go of things so earnestly contended. In contrast to this, the present Sectarians grew up out of emotional pressure, not studied religious convictions. The Independents did not avow commonality with the Sectarians, yet they so far held communication with them and occasionally defended them as to secure their support of Independency in order to render themselves representatives of large portions of the English community. For this purpose they strove to slow down the Assembly in its work in order to gain, as they could, power in Independency instead of Presbyterianism. Their filibuster tactics worked in their favor in attempting to gain time for their own popularity in the country to come to age. There is a difference, though between the political Independents and the religious Independents of the Assembly. Arising out of the political Independents was the idea of “toleration” which later the religious Independents utilized. The meaning of the term used in political ramification was that any man might freely utter the ravings of his own heated fancy, and endeavor to proselytize others, whatever his opinion may be, even though they may be averse to morality, politics, and all revelation. This kind of toleration was akin to the Antinomians, Anabaptists, Levelers and Fifth Monarchy men whose tenets were subversive of every kind of constitutional government and all distinctions in rank and property. This is what they meant by toleration, and this is what the Puritans and Presbyterians condemned and wrote against with vehemence. It is not, then, to the credit of the Independents that they commingled with these groups and gained popularity among them for their own desires, different in religious freedom as they may be. It was here, between the freedom and desire for toleration that the Independents desired and the grip of the Prelacy, that the Westminster Assembly met in order to gain a proper biblical perspective away from these two extreme positions. In 1644, the Westminster Assembly was directed to begin their formulation of doctrine with the subjects of discipline, a directory for Worship, and Church Government. This occurred just a day or two after the Assembly had approved and taken the oath under the Solemn League and Covenant. It would be improper to think that all parties could mutually bring any doctrine forth unless a solid stance was taken on the subject of church government. Can two walk together unless they are agreed? By this act the Assembly turned their attention from the revision of the Thirty-Nine Articles to these matters of polity. Everyone in the Assembly admitted that there was warrant for a Church and for church-government. This was not debated. It was the extent and form of this government that would be contested, not the reality that such a thing existed. This deliberation began by covering the offices in the church. The first office covered was the offices of Christ over and in the church. The Independents, especially Goodwin, disagreed that Christ was King over the church in terms of discipline, and rather, stressed that Christ worked through His officers, not independently. He also made objections that Christ does not hold an office in the church, though all his objections were overruled by Scripture and debate. Goodwin especially was afraid of having the “power to plant a church” in the hands of the apostles. For under such a designation the entirety of Independency would be immediately overthrown. He could not grant, then, that there was power in the oversight of the apostles to plant churches. Otherwise, this would condemn the practice of the Independents where ordinary believers formed themselves into churches, and appointed their own officers totally without the intervention or aid of any other church, or any other person previously ordained. This they would have to prove from the New Testament, and demonstrate that at no time the Jerusalem church had any authority or power over any other church at any time. This was an impossible task that immediately condemned their opinion of church government. Ultimately, this “extravagant absurdity” was abandoned by all, though for the Independents, inconsistently. Another point that was hotly debated was the power of the keys given to the apostles. The importance of this weighed heavily on the theory of the Independents, and indirectly upon the Erastian position. Goodwin, Simpson, Burroughs and Bridge contended negatively that the power of the keys was not given to the apostles as authoritative, but given as metaphor to the apostles in resembling the whole authority of the church. The Assembly affirmed the positive injunction and overruled the dissenting brethren completely. The next topic was the office of pastor and doctor. Relative agreement was in line in defining the pastor as a feeder of the people (Jer. 3:15). It was the title of doctor (or teacher) that debate grew. The Independents maintained the divine institution of a doctor, as distinct from a pastor in every congregation. But the Assembly keenly resisted this since it flavored the Independency’s type of governmental structure. It was at last concluded by Henderson that the same office of pastor may include a diversity of gifts or emphasis, and a learned pastor could in fact hold this office. Those who most excelled in study and exposition should retain the qualification of doctor (the necessary consequence of the learned man after study to engage the people of God with truth and keep the church from error) and minister in the church, or university setting, for the good of the people of God. The Assembly then turned their attention to the office of ruling elder that has been adopted exclusively by the Presbyterian system of church government. They debated this for sixteen days, and then took up the office of deacon. They touched upon the “widow” and the bearing the pastorals had in this respect to the office of deacon. The existence of an office for the widows was not proved in Scripture and so the deaconate did not include them. The final outcome was that pastors and doctors were essentially the same have a unique distinction or emphasis, and they were the highest order of divinely instituted office in the church. Deacons are likewise a divine and permanent institution though not entitled to preach and rule, but to take charge of charitable and pecuniary concerns. In 1644 the topic of church officers continued under the doctrine of ordination, a hotly debated topic in the Westminster Assembly. The Assembly wanted to add into this formulation, “That the apostles had power to ordain officers in all churches, and to appoint evangelists to ordain,” but the Independents were sorely afraid of this for if it passed, then no one else would have the power of ordination except those transferred through the apostles. This brought distress to the Independents knowing that such a Scriptural position would again overthrow the entirety of their church plants. The assembly, overruling the Independent’s desire to form a congregational ordaining process, passed the whole proposition on this. Yet, this was not the end of this discussion by any means, for the next phrase, “preaching presbyters were only to ordain” would not go over well without some form of modification with the Independents. Calamy, Gillespie and Seaman proposed that the Independents should form a committee in order to discuss this and then return their findings to the Assembly at large. Their report was given by Mr. Nye as follows: 1. Ordination, for the substance of it, is the solemnization of an officer’s outward call; in which the elders of the Church, in the name of Christ, and for the Church, do, by a visible sign, design the person, and ratify his separation to his office, with prayer for, and blessing upon his gifts in the ministration thereof. 2. That the power that gives the formal being to an officer, should be derived by Christ’s institution from the power that is in elders as such, on the act of ordination, – as yet, we find not anywhere held forth in the Word. The Assembly saw this as a filibuster and promoting no usefulness. Their use of the words in such broad strokes (such words as church, elders, etc.) was too ambiguous to be helpful. The conduct at this point by the Independents was discreditable for they couched their propositions in ambiguous wording in order to perplex the Assembly rather than make amends on the subject in a helpful way. The cause of the extreme obstinacy of the Independents in this discussion, was their fear that it would overrule two points which they held to be of vital importance, involving the essence of their system: 1) the power of ordination by a single congregation, and 2) the existence and powers of a presbytery. The subject was again resumed on March 18th, but the question of the involvement of the congregation was entered into in the debate. Rutherford said, “The Scriptures constantly give the choice of the pastor to the people. The act of electing is in the people; and the regulating and correcting of their choice is in the presbytery.” Gillespie said, “But if they cannot show just cause against him, what then is to be done? The people say, We see no error in him, in life and doctrine, but honor and reverence him; but we can better profit by another: what is to be done in this case?” He then moved that this proposition might be debated: “He that is to be ordained be not obtruded against the will of the congregation: for the prelates are for obtrusion, the separation for a popular voting; therefore let us go in a medium.” At length the debate finished by the passing of the following proposition, “No man shall be ordained a minister of a particular congregation, if they can show any just cause of exception against him.” This allowed the congregations involvement, though the presbytery had the right to ordain. On January 19,1644, Dr. Burgess reported from the first committee, who were to draw up the propositions concerning Presbytery in the following terms: 1) That the Scripture holds out a Presbytery in a Church (1 Timothy 4: 14; Acts 15: 2,4,6), and 2) that a Presbytery consists of ministers of the Word, and such other public officers as have been already voted to have a share in the government in the Church.” They also prepared a paper containing a brief statement of the chief heads of Church government, which having been laid before the Grand Committee, was by them transmitted to the Assembly for their consideration. It said, “Assemblies are fourfold: 1) Elderships of particular congregations; 2) Classical Presbyteries; 3) Provincial Synods; and 4) National Assemblies. Elderships particularly are warranted 1) By Christ’s institution (Matthew 18: 17), 2) By the common light of nature, and 3) By unavoidable necessity. Classical Presbyteries are warrantable, 1) By Christ’s institution (Matthew 18: 17), and 2) By the example of Apostolic Churches – instancing in the Church of Jerusalem, Antioch, Ephesus, Corinth, Rome, etc. The Independents would not hold these opinions, and at about the end of January, or the beginning of February 1644, they published a treatise, termed An Apologetical Narration, humbly submitted to the Honorable Houses of Parliament, by Thomas Goodwin, Philip Nye, Sidrach Simpson, Jeremiah Burroughs, and William Bridge. The date on the title page is 1643. Baillie says this was done in a sly and cunning way (published outside the Assembly) to ensue the debates surrounding the schismatic notion of “toleration.” It seems by this publication the Independents have set something forth that would hinder all agreement with the Assembly on this point. The “Apologetical Narration” is, in many points of view, a remarkable production. It contains a very plausible account of the history of the five Independent divines, the peculiar tenets of Church government which they held, and their objections against the Presbyterian system. They wrote this to express and convey a highly favorable view of themselves and their opinions to Parliament, and to the public, and to serve as the vehicle of skillfully constructed admiration to Parliament itself. The treatise begins by complaining of the accusations which were generally stated by which they had been awakened and enforced to anticipate that discovery of themselves as to a different opinion of church government. They proceed to point out the advantages that they enjoyed from the writings of the Nonconformists – the errors of the Separatists, or Brownists – the example of other Reformed Churches, and particularly the example of their pilgrim countrymen in New England. It seems they were trying to prove they were not men of “unaccommodating temper, and rigid sectarian spirit,” so they admitted that even in the worst times of the Church of England, “multitudes of the assemblies and parochial congregations thereof were the true churches and body of Christ, and the ministry thereof a true ministry” (Hetherington notes that the italics are in the work itself) “and that they both had held, and would hold, communion with them as the churches of Christ.” They also make mention of the friendly terms that they had lived with the National Presbyterian Church of Holland, as a further proof of their Christian fairness and liberality of spirit. After having given this general view of their own feelings, they stated briefly the way and practices of their churches, “Our public worship was made of no other parts than the worship of all other Reformed Churches doth consist of.” This is not entirely true, for if it were, they would have not published such an Apologetical Narration against the Westminster Assembly. They believed that though the Reformed Churches had made considerable progress, yet it seemed likely that a much more perfect reformation might be obtained, implying that this would best be accomplished by following their model. Finally, they conclude their Apologetical Narration, by asking the Parliament to regard them as men who have no wish to be hinderers of further reformation. The publication of this Apologetical Narrative was instantaneously a declaration of war. The Antapologia of the Westminster Assembly was written as a counter document of the undermining of the Independents on this course. Baillie, Rutherford, Herle and others took up their pens, in a friendly fashion to write against the Independents. Others wrote scathing reviews of the Independent’s work. In researching the Antapologia against the Independents, these points prove useful. The Presbyterians never denied that a company of true believers might be a true church, though destitute of pastors. They did not deny that they might select the most grave and pious of their number, and set him solemnly apart to the office of the ministry, without the presence of any ordained pastor, if in circumstances where that could not be obtained. This was extraordinary though, not ordinary. They agreed that the Church must possess in itself the power of all that is necessary to the continuation of its own existence. But they held, also, that Christ himself at first chose and appointed office-bearers, and gave to them authority to ordain others. This fact was a matter of precept, and to be regularly obeyed in every instance where that was possible, because it had been so commanded. They regarded the Congregational mode as a matter of necessity, which was only justifiable in cases where without it the enjoyment of Christian sacraments and ordinances could not be obtained. The error of the Independents consisted in adopting as the ordinary rule the case of necessity, instead of the method of precept. They adhered so unwaveringly to this view that they condemned and refused to admit into their communion all who could not agree with them. Since this was such a difficult controversy to climb over, the Independents would often slow down the proceedings to their liking in order to obscure the harmony that could have otherwise come from their work together. The Westminster Assembly decided the Independents should bring forth all their objections to the Assembly, instead of the public, and settle the matter. The Presbyterians said that Scripture sets forth many particular congregations under one presbyterial government. The Independent argument was given by Mr. Goodwin, “If many elders put together make one presbytery classical, then every one of those elders is to be reputed as an elder to every one of those churches; but the Word of God doth not warrant any such thing.” He also argued a minor proposition, “The deacons are not to be officers to divers churches, therefore not the pastor; the pastor is not to preach in divers churches, therefore not to rule; the several congregations are not to give honor or maintenance to the pastor of another church; one pastor was not chosen, ordained, and maintained by divers churches, therefore not to have power in them; several offices are not to meet in one and the same person.” However, the theologically trained eye will see that this argument did not oppose a Presbyterian government on scriptural grounds, but on the “supposed incongruities and inconveniences of the system”. The divines of the Assembly easily overcame this. Mr. Vines replied with the following rebuttal, “what belongs to the whole, as such, does not belong to every part,” and as Hetherington notes, “but the presbytery is an aggregate whole, and so are the churches combined under this presbytery; therefore the relations borne by the presbytery to the church of its bounds have respect to the aggregate whole, and do not interfere with the peculiar relations which the respective pastors and congregations bear to each other.” Mr. Marshall proved the proposition of the committee: That the whole Church is but one body, and its members ought to act not as distinct persons, but as joint-members; that the office-bearers were instituted by Christ, for the general good and edification, and also ought to act in unity that members are baptized not into one particular congregation, but into the general body; and that this general body is cast into societies, which are called by divines instituted churches. He further reasoned that when so many were converted in any city as to make a congregation, the apostles appointed them elders; that though they increased, so as to form many congregations in that city, they continued to be but one Church, as at Jerusalem. When Mr. Goodwin replied to all this, he admitted the truth of the maxim, “What belongs to the whole, as such, does not equally belong to each part;” for the whole is a presbytery, but every member of it is not a presbytery. Various attempts were made by him and by others of the Independents to escape from the force of the argument, and to support their own proposition, but did so without success. The subject of the power of ordination also came into play and the topic that followed was, ““That no single congregation, which may conveniently join together in an association, may assume unto itself all and sole power of ordination.” This, again, would overthrow the polity of the Independents. This moved into the doctrine surrounding excommunication which was either given to the church or given to the presbyteries. The Erastians were involved at this time since their view of the Civil Magistrate enacted the use of excommunication and discipline by the state, not the church. The answer of the Assembly extended to eighty pages on this subject. They did not want only to meet the arguments of the Dissenting Brethren, but also to produce a defense of Presbyterian Church government, one which could be given to the public. They did so entering fully into the subject, both meeting objections, and restating their own direct arguments to complete the Form of Presbyterian Church Government that was voted in by the Assembly in a majority vote. The entire proceedings of this debate in the Westminster Assembly are known as the “Grand Debate” between the Independents and Presbyterians. It is unfortunate for England, Scotland and Ireland, truly for the church in subsequent ages, that Cromwell was an Independent and by force implementing Independency after beheading Charles I. Though Presbyterians wrote against this, having more than thirty thousand printed manuscripts within these years, for a short time, by force and political expediency, Cromwell’s independency wreaked havoc on the church, which shall be touched upon momentarily. After the debates surrounding Independency and Erastian governmental concepts, the Westminster Assembly turned its attention to formulate the Westminster Longer Catechism and the Westminster Shorter Catechism. There have been inquiries as to where the outline for these originated from, but mostly without success, though hints do point to Herbert Palmer’s Catechisms, and John Calvin’s from Geneva. With the rise of Cromwell “to the throne” the Independents enjoyed a large measure of favor and power. Cromwell himself was an Independent, and abolished Prelacy and Presbyterianism in one forceful swoop of the army’s interrelations with the people and the nation. Cromwell even beheaded a fellow Covenanter, Christopher Love, when he was insinuated in a plot along with Thomas Watson and William Jenkins against Cromwell and the restoration of the monarchy (which all denied). Cromwell came in with force to rule over the despotism previously enacted by Charles. However, in removing this former despotism, Cromwell simply set up a despotism of his own. He titled himself “Lord Protector” instead of “king Oliver”, though title did not matter in terms of state policy. This gave time for the Savoy Conference to take place, and set forth a Congregational Confession. Cromwell, though, did not approve this Confession. It never received his public sanction. When Cromwell died, Charles II was restored to the throne, and the “Restoration” occurred of both the Prelacy in the Church of England, and of Presbyterianism between Scotland, England and Ireland (though it seems that Scotland most benefited from the work of the Westminster Assembly as a whole). The religious body once known by the name of Puritans, became Presbyterians both in principles and practice, partly before, and thoroughly during the time of the Westminster Assembly. Note must be made of the system of doctrine assembled in the Westminster Confession of Faith. The Westminster Assembly’s Confession of Faith may be safely deemed the most perfect statement of Systematic Theology ever framed by the Christian Church. 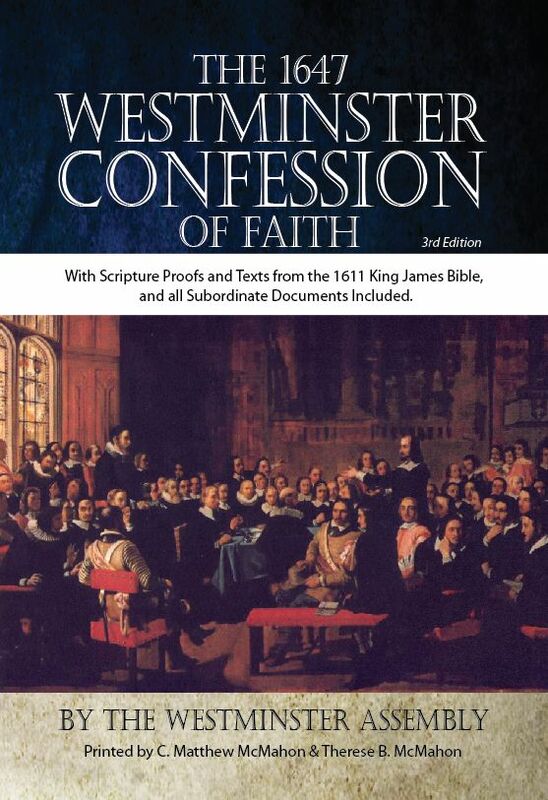 In comparison to the document of the Savoy Conference, and later of the London Baptist confession which was a copy of the Savoy Declaration, the Westminster Confession of Faith stands far superior in thoroughness, thoughtfulness, and literary inscription. The Confession went through a single draft and then was sent to Parliament for approval of the entire Standards. In 1647 it was published and six hundred copies were first given to Parliament, and then subsequent copies made for the public and for the surrounding countries. It has been the most widely used catechism and Confession of Faith in the Christian church besides the Apostle’s Creed.